As a mom, I am always looking for natural, healthier choices for my family, but sometimes our options are limited. You know the old saying, "you are what you eat?" Well, it's true. The vitamins, nutrients, and sources of our daily fuel are what your body uses to rebuild itself every day. It's really no wonder why so many people struggle to feel better when they choices are packed with processed sugars, artificial ingredients, and unpronounceable chemicals. That's why E-hydrate set out to create hydration, nutrition, and energy products that are natural with great tasting, real flavors born in the kitchen, not a laboratory. E-hydrate Protein On-the-Go delivers clean, natural protein with only 150 calories and just 4 grams of sugar per pouch, and E-hydrate Adult and Kids Hydration Drink Mixes may be added to any liquid to deliver essential vitamins, minerals, and more electrolytes than the leading sports drinks, without the sugar and artificial ingredients. Finally, a nutritious way to fuel your busy and active family! My favorite are the hydration drink mixes. My kids always "steal" my drink when I make them and so I just make them one of the kids to share. The protein packs are awesome because you can mix water right in. I still decided to put it in my blender bottle though because I like ice with my protein shake. Makes them very yummy. I love that you can save 20% off your first order at E-hydrate.com with code MOMSMEET! Such a great deal! You can even use it on their sample packs making a $20 for only $8! So you can try every E-hydrate Protein On-the-Go product for only $8, buy two and you can score FREE Shipping! 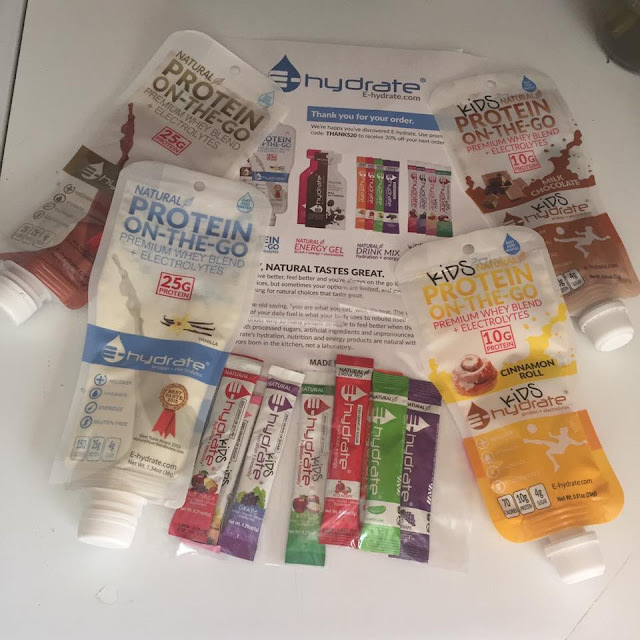 One lucky reader will win two E-hydrate Ultimate Sample Packs! A single pack is valued at $25, so the total prize is valued at $50. Each sample pack contains: 2 Protein On-the-Go pouches (Chocolate & Vanilla), 4 Hydration Drink Mis Sticks (Lemon-Lime, Red Berry, Orange, and Grape), and 4 KIDS Hydration Drink Mix sticks (Strawberry Lemonade, Fruit Punch, Grape, and Apple). Entry is simple, just follow the prompts on the Rafflecopter below. Open to US only, must be 18+ to enter. Make sure to follow us on Facebook so you can stay up to date with our current giveaways. Good luck! Welcome to the Garden of Giveaways Hop! I want to try e-hydrate products because they're natural and green. I like the idea of natural protein and even better that it is grab and go. This would be nice to try. They would be perfect for our hiking adventures!! We love to go hiking in the summer and Im always trying to bring nutritional items but there's never any room! These would be amazing! Easy to take on the go and natural ingredients. I want to try E-hydrate because it is simple to use and easy to just add water. I like that there are protein products also. I lie that Natural Way uses all natural ingredients, so you don't have to worry about all those artificial chemicals that are sometimes in foods.